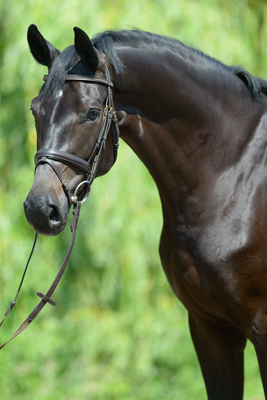 This black 5-year-old Hanoverian mare by Foundation is an elegant, light footed rectangular type. Her gorgeous head with expressive eyes caught our attention. She is alert, attentive, sensitive and a little shy. Felize has a trot with lots of “schwung” and an active hindleg. Her canter is very smooth and balanced and her walk active and ground covering. She reacts eagerly and to the finest of aids, making her an absolute pleasure to ride and work with. Felize has lots of placings in dressage horse tests at Elementary level.